The rain cleaned the cobbles in the night, giving way to a fresh mist which hung lightly over the slow-moving Tiber. A man with the only gas-powered leaf blower we’d ever seen in Italy blew damp leaves down the stairway beside the Ponte Mazzini, rousing the sleeping gypsies who live under the bridge. As we waited for our bus under thinning trees along the boulevard, we noticed that everyone around us had on sweaters and jackets and bell-bottoms. That same coolness which to a Seattleite was refreshing had made the Romans bundle up tightly overnight. The mercata della pulci in the Porta Portese at the south end of the Trastavere was already humming with life by the time we arrived. The wide thoroughfare on which cars generally flew hell-bent to the airport had been transformed into a miles-long flea market winding through the neighborhood. 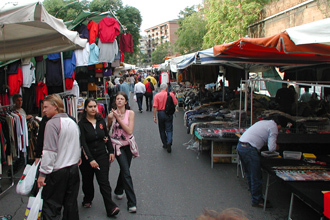 Hundreds of stalls now lined every side street between the river and the old city wall, offering new and used clothing, fossils, gadgets, kitchenwares, electronics, furniture, jewelry and knickknacks as far as the eye could see. Locals swear you can buy anything here on a Sunday morning, as long as you have the time to search and the wherewithal to haggle. Eyes wide, we had to agree. At one corner, an enormous hill of shoes was under attack, old ladies jabbering excitedly as they threw elbows at one another. A small dark teenager in a leather jacket watched the women moodily as he threw plastic-wrapped dress shirts onto a U-shaped table nearby. A bit farther along, I made the mistake of lingering too long over a little toolkit with tiny pliers and, before I realized what was happening, the vendor had put the toolkit in a bag and was shoving it at me. I put up my hands, ignoring his shouts as we walked quickly away. And then, just as the sun peeped from behind a cloud, hunger overtook us. Out on the main drag, we came upon a row of food stalls, bursting with salame, cheeses, prosciutto, little pastries and hunks of pizza. From a cheerful truck vendor, we chose sandwiches – Roman style sandwiches – which were, as with everything Italian, based on quality, not quantity. The man popped sandwiches into our hands and smiled as we handed over coins. And were those sandwiches good? Oh, yeah. 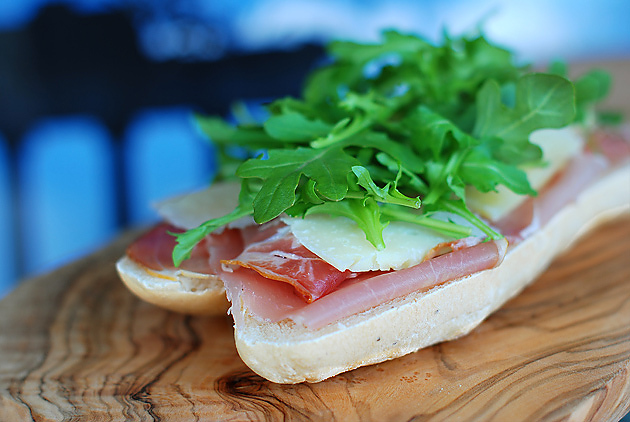 A few slices of heavenly prosciutto, slices of salty pecorino (what in our family we call ‘Emiliano cheese’), a bit of arugula and a drizzle of olive oil. All this on top of a sliced roll that was so fresh I could only imagine the family had been up in the night tending the fire. So what’s not to love? We had it all there: the shoulders of ten thousand Roman compadres to rub, a neighborhood more than a thousand years old to explore, and everything under the sun to peruse. We bit in and watched the whole world turn. Here’s my take on those oh-so-honest rolls. Note: For authentic flavor and texture, Italian bread is made with a piece of day-old dough which is often called ‘La Nonna’ or the Grandma. You can use any dough left over from making bread or pizza, as long as it hasn’t dried out. Alternatively you can make a Biga by combining 1¼ cups of flour, 5/8 cups water and ½ teaspoon of dry yeast, and letting it bubble overnight. Either way, you’re tapping into a very old baking tradition. Make the yeast mix: Put the Biga or 12 ounces of day-old dough cut into pieces into a large mixing bowl, pour on ½ cup of warm water and top with the dry yeast. Let sit for 15 minutes, agitating once or twice, until the mixture is frothy. Make the dough: Add the two flours, and dry mix with the salt. Make a well in the middle and pour in the water, a bit at a time, gathering in some of the flour, and then finally add in the milk. Using the handle of a wooden spoon, gather the whole mass together, scraping down the sides of the bowl as necessary. Sprinkle ½ cup of flour onto a counter. Using a dough scraper, clean the mass of dough from the bowl and plop it onto the flour. Fold the dough onto itself, turn it over and cover with the bowl. Let rest for 20 minutes to a half hour to fully hydrate before continuing. After a rest, knead for 10 minutes, using extra flour as necessary to keep it from sticking to the counter. Your hands will get a bit sticky in this process, but please don’t overdo it on the additional flour. Your end goal is a smooth and elastic dough ball, the foundation for good bread. Toward that end, clean off your hands under the tap, dry them well and persevere! First rise: Put the dough ball back into a clean mixing bowl, cover with a damp cloth or plastic, and let rise at room temperature until doubled in bulk, about 2 hours. Second rise: Deflate the dough, knead on the counter for a minute or so, and return to the bowl for another 1½ to 2 hours. 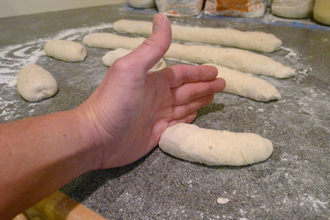 Shape and wet the rolls: After the second rise, shape the dough into a snake, tucking in the skin to form the gluten cloak. Continue forming an elongated stretch of dough, letting it rest as need be to achieve a long tube of dough with a taut skin. Break this into 2 strands, and then 4 pieces; after a few minutes rest, break each of those strands in thirds to make 12 pieces, using the edge of your hand like a saw to make each cut. Put the pieces onto 2 lightly floured cookie sheets and, after 10 or 15 minutes, make each piece longer and thinner. Sprinkle the sheets with semolina and arrange the rolls on them. Wet the tops of the rolls with a little water and finish with a little semolina or cornmeal. 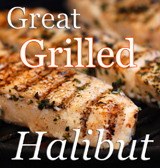 Let these rise for an hour at room temperature or until doubled in size. Move the risen rolls onto a wooden peel or a flat cookie sheet and let rise for a final 10 minutes. Bake in a conventional oven: Line the center rack of your oven with quarry tiles or put down a pizza stone and preheat to 425° for 30 minutes. Slip rolls directly onto the ceramic surface and bake for 8 or 9 minutes, turning end-to-end once. Because of the low salt content of these rolls, they will still be light brown when fully baked. 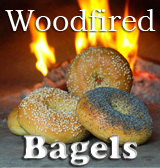 Bake in a woodfired oven: Your fire should be two hours old with a moderate bed of coals. The oven should be at medium heat, with a fair amount of black ash still on the walls. For best results, move the fire around in the last hour to make sure the floor is evenly heated. When the rolls are nearly ready to bake, push the coals to the back, toss on 2 or 3 small sticks to keep the fire active but low and brush the floor well. 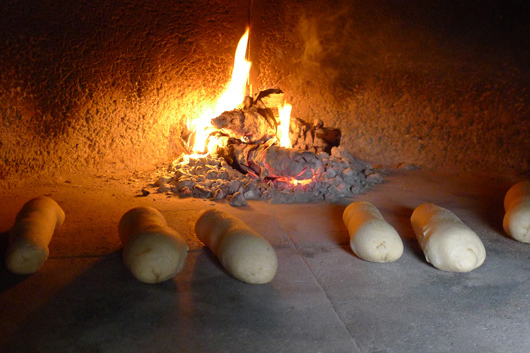 Slip rolls onto the floor, ends toward the coals and bake for 8 or 9 minutes, turning end-to-end once. Because of the low salt content of these rolls, they will still be light brown when fully baked. Cool for 30 minutes or more before filling with prosciutto, pecorino cheese and arugula. Top with a little good olive oil, and imagine the market of old Rome swirling around you as you bite into a bit of culinary heaven. Buon Gusto! mmmmm…I remember those sandwiches from my travels….great looking bread! Haha! Took me back. We bought sandwiches like these from a vendor and tried to sit on The Spanish Steps to eat them … only to be told by a Roman cop that we couldn’t picnic on The Steps. Sooo we schlepped up the Steps and into the park above to picnic. Ahhh, what great memories of Rome! Thanks! Wow! You just transported me to the Trastavere! It’s been many, many years, but I can still feel it. I’m in the baking bread mood, and your rolls look fabulous! These look so darn good. Nothing like a good Italian roll. Unfortunately I do not have the knack for baking but these are worth attempting to do.I mean…it’s bread.Always worth it…CHEERS! What a gorgeous shot of the rolls in the oven! Your story makes me miss Rome and all the crazy markets in Italy too! We just arrived in Seattle – we’d love to see your oven someday. Tremendo!! What happy memories of Rome this brings. Grazie ragazzo! Fabulous on top 9! I absolutely love the photo of the rolls in that oven. Bravo. What a beautiful and colorful memory! Thanks for taking me back to Rome for a minute. Mighty fine rolls! I seem to remember these flashing across my Top 9 screen!!! Nicely done, Don! I’ve copied the recipe, I’m going to give them a go… biga goes together tonight! Every time you blog about dough and your wood fired oven, I just want to start out in the back yard and break ground for my own piec of featured outdoor cooking equipment! I can smell the wood burning from here! Love ‘em!! I made a batch and served them at our Super Bowl party with salami, cheese and arugula… bit hit! Thanks Don! This recipe is a keeper.